“Chess is everything: art, science, and sport.” So says Anatoly Karpov in a quote posted on The Knights of the Square Table website. 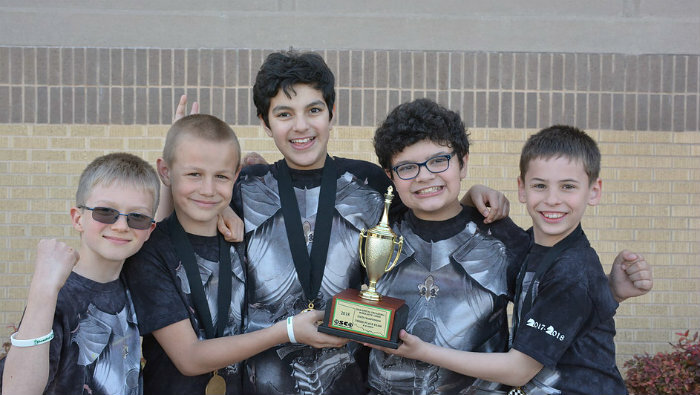 The Knights are more than just a chess club; they’re a competitive chess team that trains teams of kids ages kindergarten through 12th grade. Although they’re located in Edmond (just north of Oklahoma City), they accept members from all over and don’t work with one specific school district. If you’re looking for a chess club in Oklahoma that specializes in students with a passion for the game, look no further! The goal of the Knights of the Square table is to build their team members’ self-esteem, confidence, and integrity. Throughout each training session and competition, they work to encourage dedication, development of skills, and good sportsmanship amongst their members, as well as promote an atmosphere in which healthy competition and team spirit can thrive. One of the things we found particularly cool about the Knights of the Square Table is their focus on online training. When a kid signs up as a Knight, they must purchase a gold membership on www.chesskid.com, a site that was designed to teach kids the game and allows them a safe forum in which to play chess with other kids online. For more advanced team members, the Knights coaches recommend a membership with chess.com (a site for adult chess players; settings can be customized to make it safe for kids to play, as well). Why do Knights need these online memberships? While the weekly in-person training students receive is among some of the best in all the chess clubs in Oklahoma, playing once a week isn’t enough to prepare for a tournament. Elite players practice for hours a day, but the Knights of the Square Table only asks its members to commit to practicing for 20 minutes each day. Since playing with other family members or practicing with others at chess meet-ups isn’t always possible, these online forums give Knights the opportunity to hone their skills in the virtual chess world – something that will pay off big time when they play in their next competition! The team has weekly meetings every Thursday from 6:30 to 8:00 p.m. at the Holy Trinity Lutheran Church and School in southern Edmond. Chess season starts at the beginning of September and runs through the end of March; holidays when the team doesn’t meet are indicated on its website. Otherwise, team members are expected to commit to attending weekly meetings (as well as daily chess practice). It’s the only thing that can prepare them for the event that gets every chess player’s heart pumping fast…the tournament. After weeks of practice and careful study, this is where team members get to show their chops. The Knights of the Square Table face off against other private and public school chess teams in tournaments all over the state one Saturday every month. Tournaments are held via the Oklahoma Scholastic Chess Organization (OSCO) and fees are $20 in advance and $25 at the door for regular tournaments and $25 in advance and $30 at the door for larger events such as the Blitz Championship, Grade Championship, and State Championship. Knights are required to attend most tournaments. Not only does this demonstrate a commitment to the team; it also helps ensure the team has enough members to compete in each event. 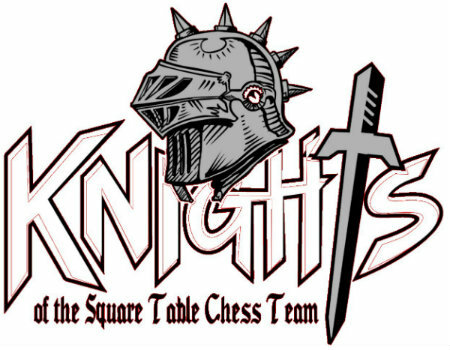 To become a member of the Knights of the Square Table team, there is a one-time registration fee of $55 that pays for chess equipment, the curriculum, and a custom chess team T-shirt. Ahem! Back to business. After the registration fee, lessons cost $10 a week, with the payment for the entire month due at the first meeting each calendar month. Team members are also responsible for their tournament fees (outlined in the Tournaments section above). Knights of the Square Table coaches have decades of experience playing and winning at chess. When they’re not playing or studying to improve their game, they’re working with others to help them develop their chess skills and strategy. The coaches are the only Knights of the Square Table staff that are compensated for their time; to keep membership prices low, volunteers run everything else. The Knights asks any parent volunteers who are interested to donate their time and organizational skills to help administrate and run the chess team. It truly takes a village to raise chess masters! While other sports often depend on factors such as size and age to determine who get matched with who, chess provides an opportunity for kids of all ages to play against one another. Age doesn’t determine chess ability; skill does – and the Knights of the Square Table has seen younger team members win against players who are much older. 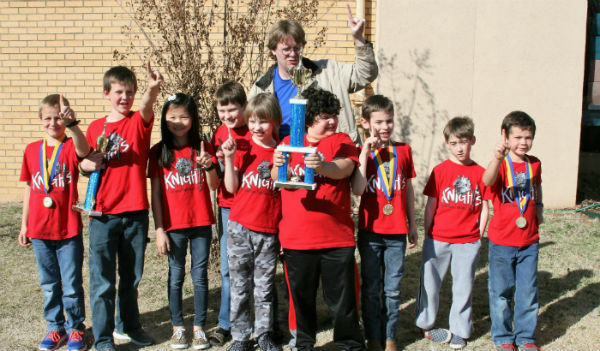 If you live in Oklahoma and are looking for a kid-friendly chess team to improve your child’s chess skills, confidence, critical thinking, and problem-solving abilities, look no further than the Knights of the Square Table!